...continue reading "January 2019 Impressions"
...continue reading "December 2018 Impressions"
...continue reading "Adrian Oliver takes the Championship!" < ...continue reading "October 2018 Impressions"
September Impressions ...continue reading "Impressions September 2018"
August Impressions ...continue reading "Impressions August 2018"
Classicline Insurance – Supporting the Imp Club! Classicline Insurance are developing their relationship with the Imp Club. 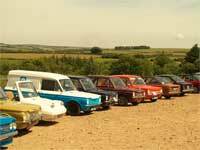 As the chosen insurance provider of the ARCC (Association of Rootes Car Clubs) Classicline are developing strong links with the Imp Club. Take a look at Clasicline's latest News feature where they have a very IMPressive feature "Spotlight On: The Imp Club"
Classicline will be attending Imp 2018 at Prestwold Park on Sunday 5th August - please make time to ask for a quote for all your insurance needs. July Impressions will be with all Imp Club members soon - look out for the Imp 2018 National Final update and booking form! ...continue reading "July 2018 Impressions"
Have YOU ever thought about getting more involved in the running of The Imp Club? The services you receive as a member don't just happen - behind the scenes there are around 60 Imp Club members who help to ensure the smooth running of YOUR Club. ...continue reading "Calling Imp Club Members!" June Impressions is now being printed ...continue reading "June 2018 Impressions"